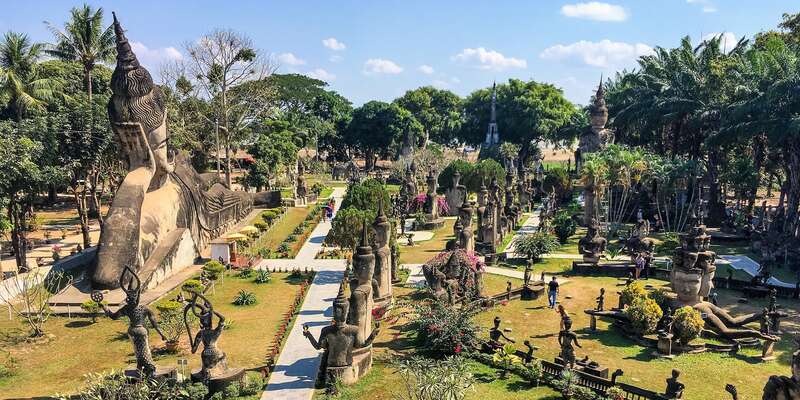 Xiang Khuan (literally meaning “spirit city”) is a sculpture garden 15 miles (25km) east of Vientiane. 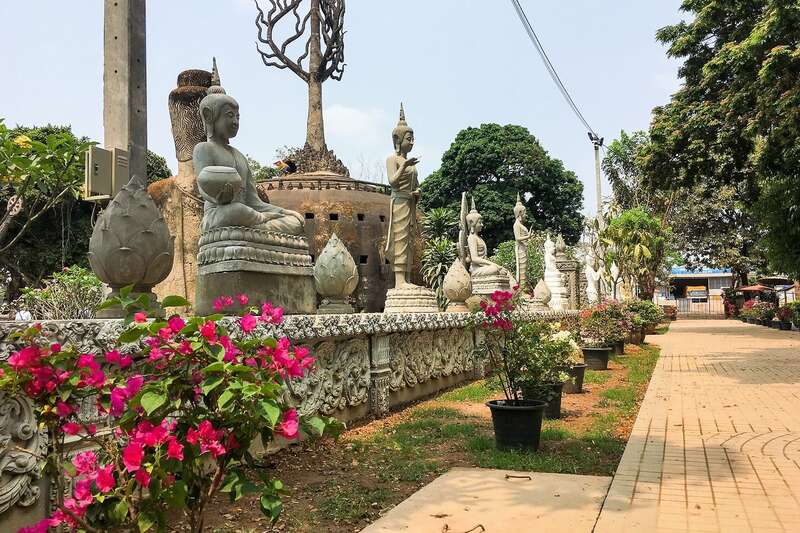 Commonly known in English as “Buddha Park,” it certainly lives up to its nickname, featuring over 200 statues depicting Buddhist and Hindu figures. In short, it’s one crazy place that you wouldn’t expect to find here, or anywhere else, for that matter. 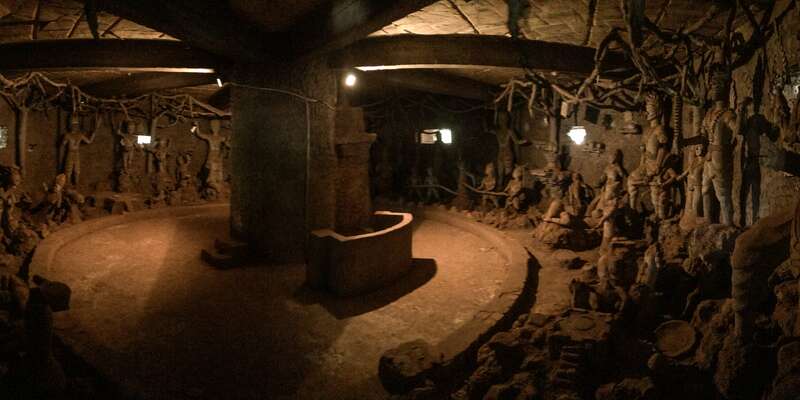 Lori and I are taking this particular Saturday to explore this one-of-a-kind place (well, almost one-of-a-kind, but I’ll get to that). We caught the #14 bus to Xieng Khuan (some only go to Friendship Bridge/ Thai border, so you’ll want to confirm) at the Central Bus Station in Vientiane (across from Talat Sao “Morning Market”). 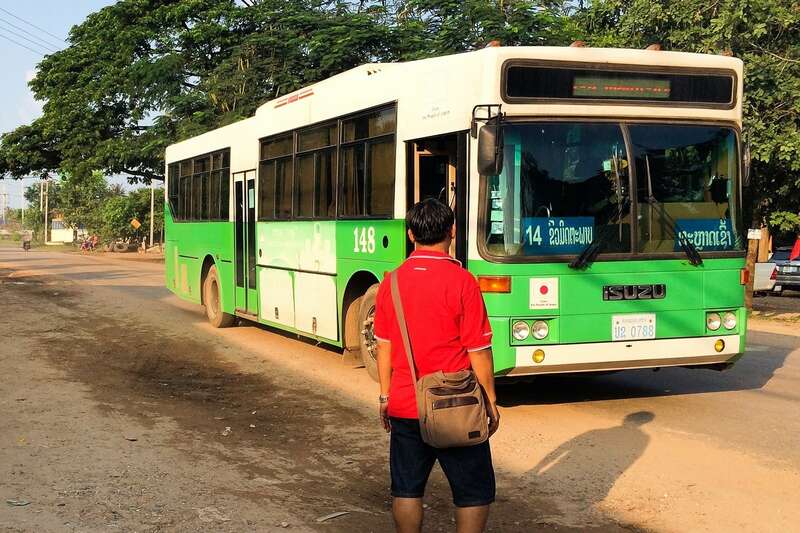 We were pleasantly surprised that for 6,000 kip (US$0.75) per person each way we got a pleasant hour-long ride with air conditioning and comfy seats on one of Vientiane’s big Japanese-donated green and white city buses. If we had hired a tuk tuk for the day to take us out there it would have been between US$25-$40, and definitely not as comfortable of a ride. Currently, buses run all day long about every 20 minutes. Entrance into the park was 5,000 Kip ($0.60) and an extra 3,000 Kip if you have a camera (though this does not seem to apply to smart phones with cameras). Now that we have that formalities out of the way, bring on the Buddhas! …Or…giant…pumpkin? 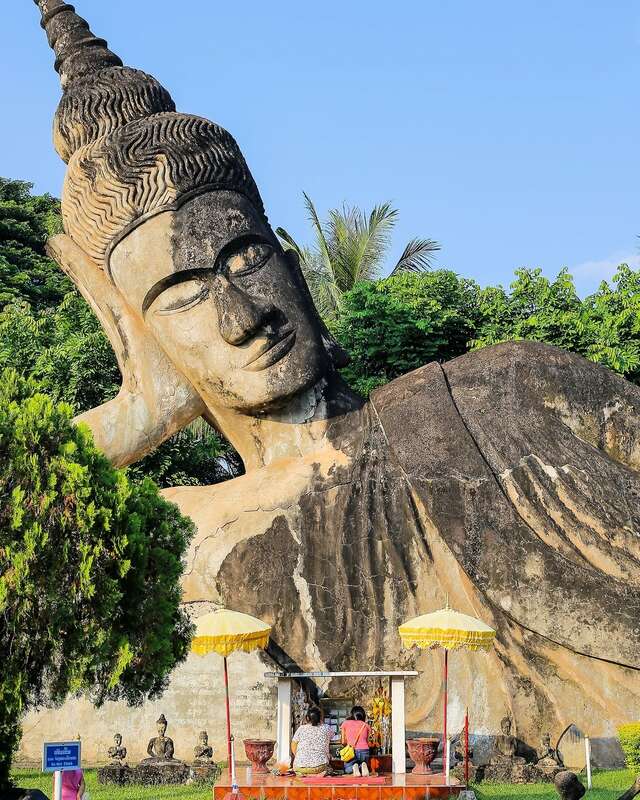 Not exactly what I had in mind for a Buddha Park. 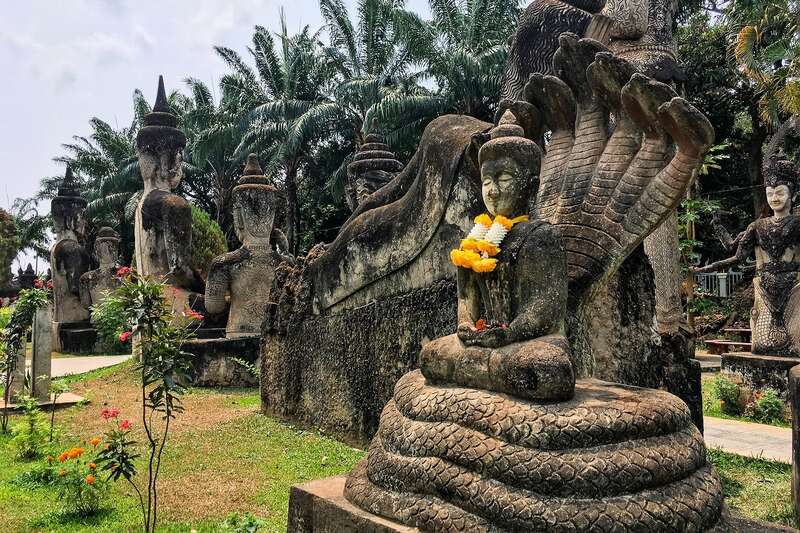 While there are numerous statues depicting the Enlightened One, himself, there are also many other religious symbols and imagery, including characters from Hinduism such as Shiva, Vishnu, and Arjuna. And then, there’s the giant pumpkin, which has three levels representing Hell, Earth, and Heaven. Simply enter through the demononic head and see for yourself! 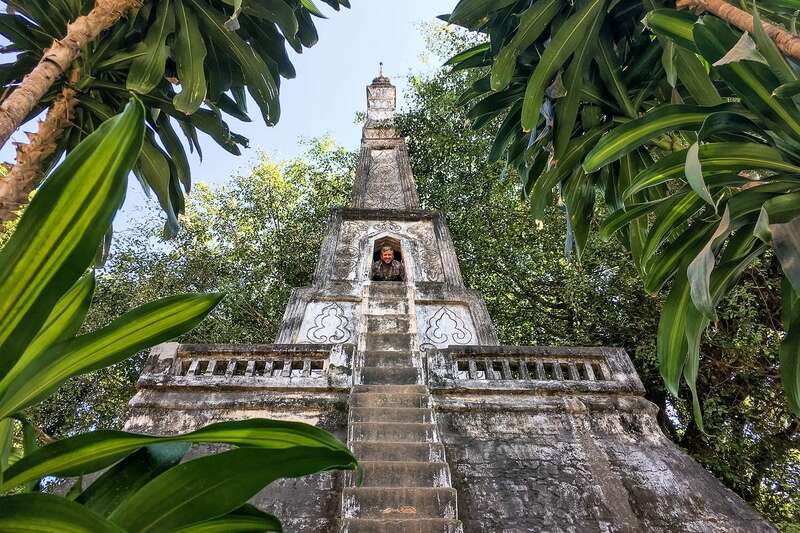 After shimmying and squeezing our way to the top, we were treated to a sweeping view of the grounds — and the hot midday sun. 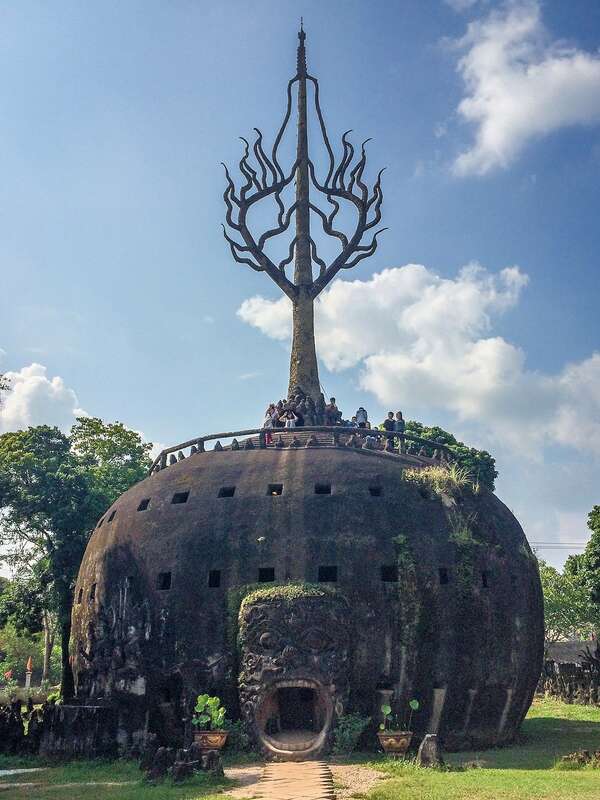 So, what exactly is the deal with this so-called Buddha Park, anyway? At first glance, this place appears to be very old stone handiwork. 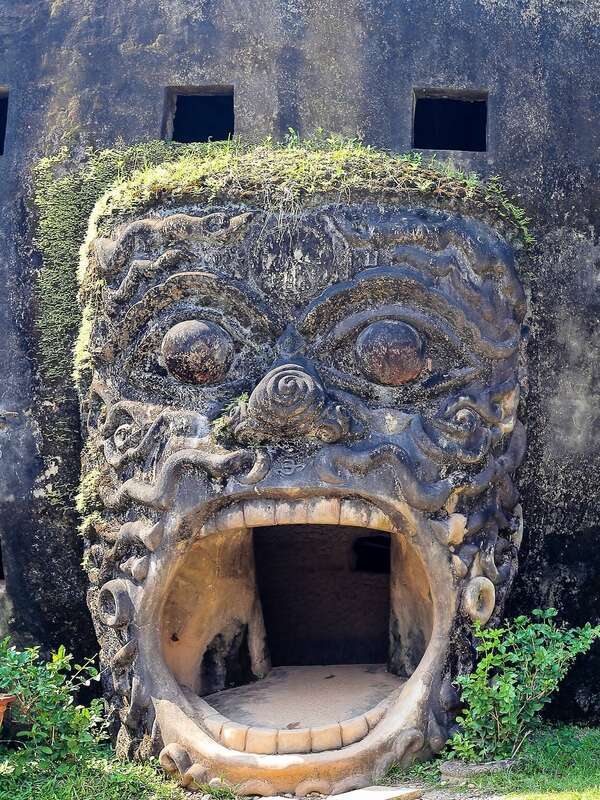 In reality, however, most of the statues and sculptures were constructed of reinforced concrete beginning in 1958 by a sculptor named Bunleua Sulilat, whose unique Buddhist-Hindu perspective was largely shaped by a Hindu rishi (sage) who he studied under in Vietnam (the story at Buddha Park actually says he met the rishi after falling into a cave when he was a child…you can choose which story to believe). 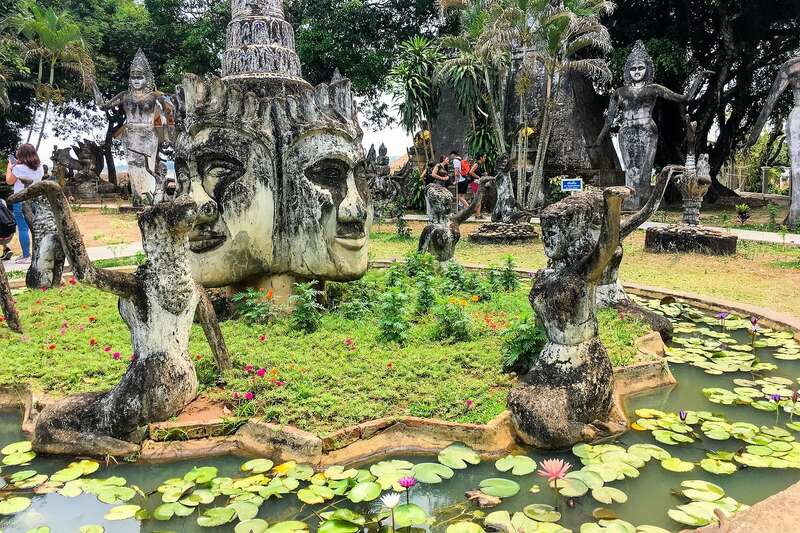 Buddha Park seems like a one-of-a-kind place, but there are actually two such parks sculpted by Sulilat. The other lies just over the Mekong in Nong Khai, Thailand. After the 1975 revolution in Laos, Sulilat fled across the river. Missing his beloved sculptures [I guess], he decided to build another park called Sala Keoku. The sculptures are fascinating, but perhaps the biggest surprise of the day was the on-site restaurant toward the rear of the park. 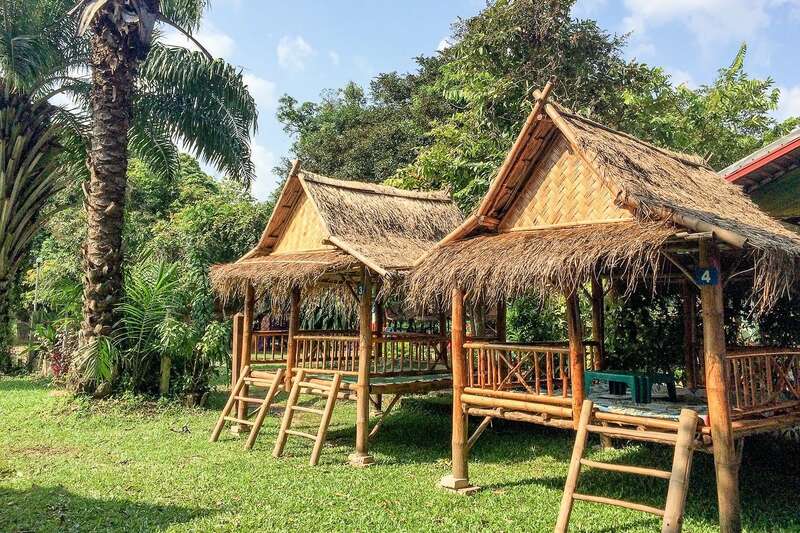 There are relaxing covered bamboo huts for dining in, and regular old tables for those not feeling the Lao experience. 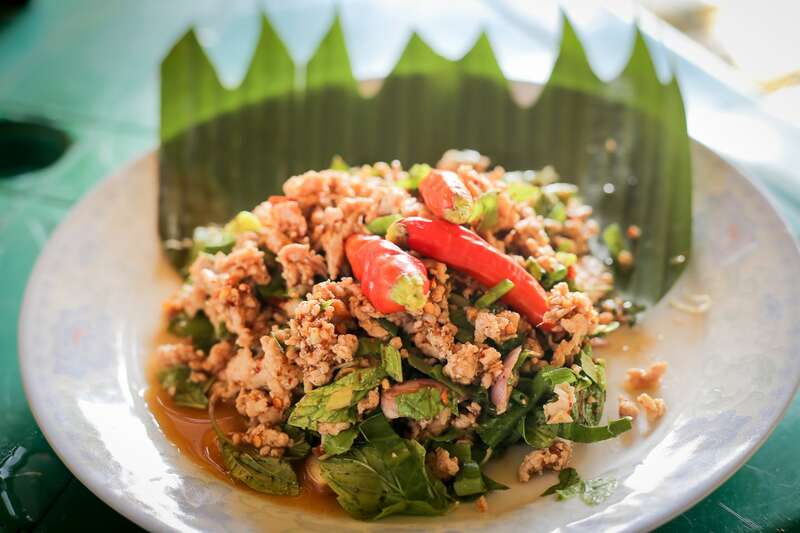 The pork laab (larb) served at the restaurant was some of the best I have had anywhere in Laos. And hell yes, it’s spicy. That’s the only way to eat it! The park recently received a sizable investment to perform the first major refurbishment and upgrade since the park was constructed in the ’50s and ’60s. Work was completed in early 2018, including beautiful new walkways, lots of landscape work with countless brightly colored flowers, and…modern restroom facilities to replace what had to have been the park’s original toilets. 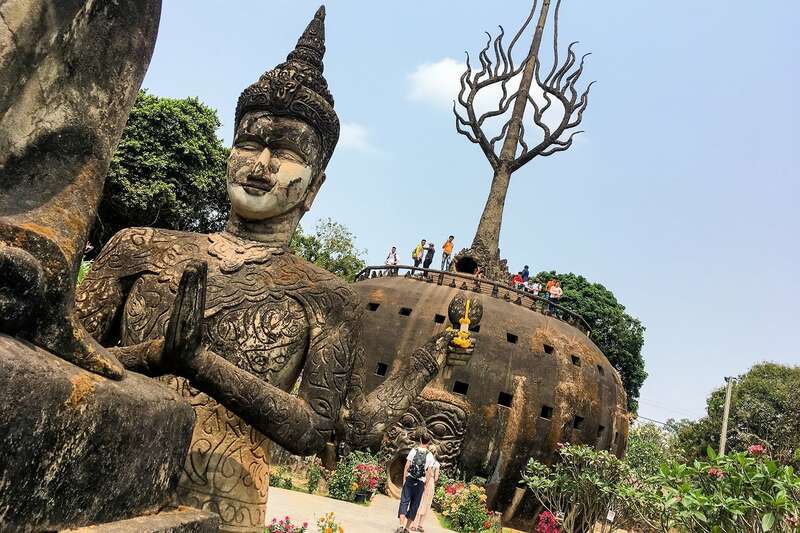 Buddha Park held a special place in our hearts for having one of the few remaining bucket-flush squatty potties in the city that we have come across. That era has finally come to a close. All told, our day out ended up costing the us about US$14 (including roundtrip transport, entry, and a delicious and satisfying meal). And just as promised, the #14 bus arrived less than 20 minutes after we saw the previous one pass. Granted, we sat in the bus for a half hour waiting at the Lao-Thai Friendship Bridge parking lot, but it was a small price to pay for cheap, reliable, and air-conditioned transportation back to the city.